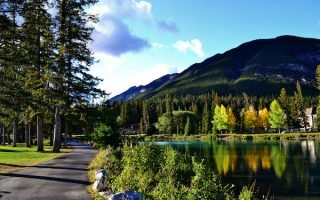 Running in Banff, Canmore, and Lake Louise. Best places to run in Banff, Canmore, and Lake Louise. 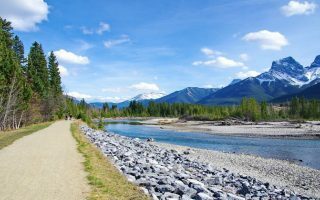 Best flat/gentle path runs: Legacy Trail, Bow River (Canmore), Bow River/Fenland/Hoodoos Trail (Banff), Lake Louise Shoreline Trail, Old Route 1A (Lake Louise). Best flat/gentle road runs: Banff Downtown streets, Vermilion Lakes Rd., Cave and Basin run (Sundance Canyon), Golf Course Loop. 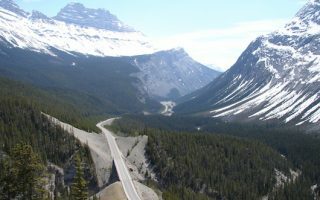 Sections of the Icefields Parkway. Slightly More Adventurous Trail or Hill Runs: Goat Creek Trail (Canmore to Banff), Lake Minnewanka Trail, Mt. 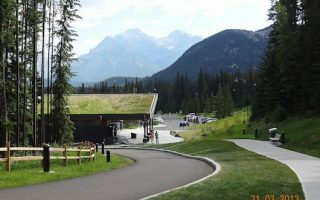 Norquay Scenic Drive (Banff), Tramline (Lake Louise). Notes: Some roads/trails might be closed/not maintained in winter (see individual posts). It can be very cold — bring appropriate clothing! And in summer, be aware of bear and elk. We recommend bringing bear spray and not running alone on trails. Also note Banff’s altitude is 4,500 feet. Finally, use public transit when possible: the ROAM bus system is excellent! 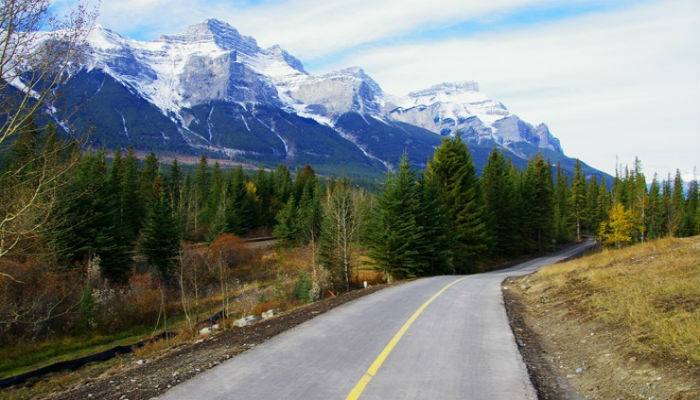 The 233 km Parkway between Lake Louise and Jasper is considered one of the most scenic drives in the world. Runnable even though it's a highway, since there's a decent shoulder. We highlight some of the best sections for running. A gorgeous, relatively flat trail with fabulous views, popular with runners and cyclists. Parallels the Trans Canada Highway. Runs for 27 km from Canmore to Bow Valley Parkway at Banff Park east gate. 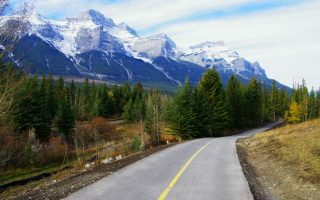 Our guide to the best roads and multi-use paths for running in the outdoor recreation mecca of Canmore, which is the eastern gateway to Banff National Park. Top spots: Legacy Trail, Three Sisters Trail, Bow River Paths, Harvie Heights Trail, AB-742. 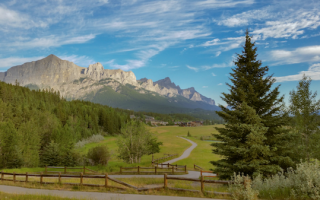 Canmore sits between Calgary and Banff and is a major outdoor recreation center and gateway. This is a guide to some of the best easy-to-moderate trail running in the area, including the Bow River Paths, Nordic Center, and Goat Creek Trail. 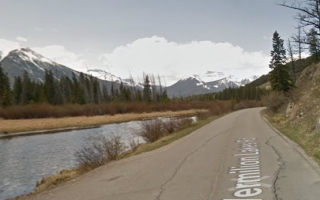 One of the best options for a flat and scenic road run in Banff. The road runs parallel to the Trans Canada Highway, featuring wonderful views of the Vermilion Lakes and nearby mountains. Up to 12 km out and back, including a section of Legacy Trail. 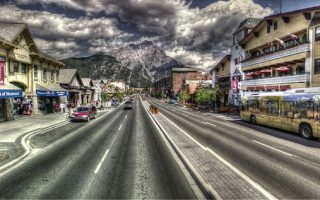 Create your own route around historic downtown Banff. Use Banff Ave., festive at any time of year as the anchor, and then run the grid-like side streets (named after animals), making sure to incorporate the Bow River Trail. Good option at night, and in winter. Three very pretty, somewhat interconnected trails for running, all accessible from downtown Banff. They can be run standalone or combined in multiple was to make for a longer run. Flat and fairly easy, more path than 'trail'. 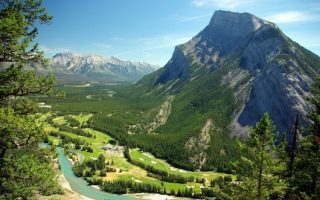 This 11 km loop has everything: pretty paved road along the famed Banff Springs Golf Course, then sections through woods, past meadows, and along the Bow River with great mountain views. Can do shorter 6k out and back. Note: closed Nov.-May. A wonderful run on a paved road and path that's car-free after the first mile. Run from town to site of hot mineral springs in a cave, and then along a lovely and fairly flat path/road for 2.5 km before it becomes more rugged and hilly. If you want a 10-mile road run with killer hills and views, this is is the one to do in Banff. Mt. 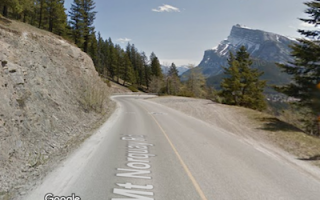 Norquay Scenic Drive climbs steadily for 320m (1,077 feet), ending at Mt. Norquay Lodge. NOTE This road can be very busy and there is no shoulder. 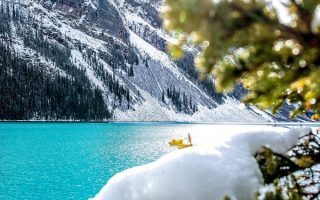 Our recommendations for the most scenic, accessible, and modest trails/paths for running in Lake Louise: the Lake Louise Shoreline Trail, Bow River Loop, Great Divide/Highway 1A, Tramline, and Moraine Lake Shoreline Trail. 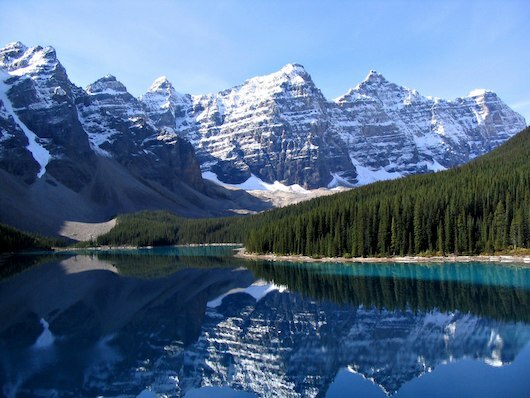 Banff features cold, occasionally bitter winters and pleasantly mild summers. Mid-summer high temperatures are typically sunny and average a perfect-for-running 21C (70F), with cool nights, dipping to 8C (mid-40s). Always have a layer! Winters are cold and snowy. Average high temperatures in January-February are -5C (20F), and lows are -14 (10F). BUT, there can be bursts of bitter cold, well-below zero. In winter, be prepared for snow and ice that can last from late October to early April. See also information on roads/trails that are closed in winter. 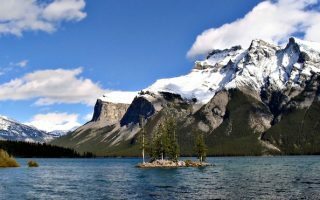 There’s a good selection of hotels in Canmore, Banff, and Lake Louise (but little in-between, as it is a national park). This includes the famed Banff Springs Hotel, and Fairmount Chateau Lake Louise, both relics of the network of CP Hotels that graced the route of the Trans-Canada Railway. Most hotels are centrally located and will be near some of our fave running spots in town. There are numerous sporting goods stores in Banff and Canmore that sell all sorts of outdoor equipment, including running gear. The one independent, running-centric shop in the area is Strides Canmore (and they were very helpful with this guide!). They have guided mountain running tours and also do numerous events and clinics. Ski Uphill in Canmore also sells running gear. In Banff, Vertical Addition is a good bet. Banff Marathon. June. The signature running event in the area.